We all know we can combine Meat and red wine for a classic combination to create that elegant meal. For the ability to balance and highlight the meats flavor profile, all you need is a good bottle of Vino which can elevate the taste sensations to a whole new level. Every bold bottle will match perfectly with a cut of meat, getting wine wrong is one of the big cooking mistakes. Even if it is bone-in rib eye with the lush Cabernet Sauvignon, a skirt steak having Pinot Noir or a juicy rib having a red blend, we have wines from around the world to pair well with your meaty meal. Look for light or medium bodied red wines when pairing wines with lean cuts. The wines should have a slightly higher acidity that enables it to cut through the texture of lean meat. 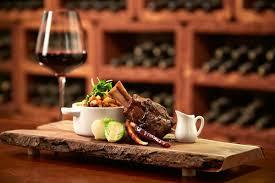 A very important rule in the wine world is that you should match the intensity of the meal with the wine. For example, if it is top sirloin beef stew you need slightly bolder medium red wine like Sangiovese. Fatty meats go well with bold red wines having high tannin. Tannin can be categorized as an astringent and works as a palate cleanser by 'scraping' the fattiness from inside your mouth and the reason why bold red wines like Napa Cabernet or Barolo work so well with the fillet. Add some nice sides and sharp kitchen knives and you’re set to enjoy a great meal. Since lamb is more delicate in flavor compared to beef, it is a good idea to choose a lighter and more delicately flavored type of wine. You should also consider the sauce when pairing because lamb takes on the flavor of the source. In this case, it is wise to choose medium bodied wines or bold reds having smoother tannin. Some examples include Syrah, Touriga Nacional, Petite Sirah, and Petit Verdot. Veal is one of the few red types of meat which can match the white and rose` wine. This is why Wiener schnitzel which is a classic Viennese dish matches perfectly with Austrian Gruner Veltliner. In this case, the delicate flavors of the veal are maintained by frying. Therefore, make sure you understand the method of preparing the meal and what sauce was used when pairing. Veal also takes on the sauce flavor just like lamb. Can I give you a few examples? Pair it with lighter reds like Rose` of Sangiovese, Pinot Noir, Zinfandel and Valpolicella which is made with Corvina which is a local Italian grape. Venison is a rich and at times gamey red meat. It is also pretty lean. It is good to try rustic medium bodied red wines. Combining the two will make the wine have a fruity taste and meat a less gamey taste. Some few examples? Check out Chateauneuf-du-Pape, Cotes du Rhone, Montepulciano d'Abruzzo, Chianti, and Valpolicella.